Since the age of 5, Legacy has been capturing hearts with his soulful melodies. He began singing in church, but as he grew older his achievement in sports overshadowed his hidden passion for music. Once Legacy entered his teenage years his passion for music over powered him and could no longer remain contained. Since then, the Mississippi singer and songwriter has worked hard to develop himself into a capable up and coming artist. Legacy began recording songs with rappers when he was noticed by a Phoenix based label, but ultimately he decided to venture out and pursue music independently. Legacy has shared the stage with KC & JoJo, Choppa, Lil Cali, Bobby Valentino, and B.G. Legacy has captured the hearts of plenty through his performances throughout Mississippi, Louisiana, and Alabama. 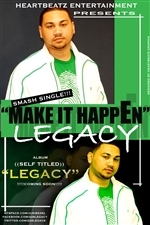 With his newly released single "Make It Happen", Legacy is definitely an artist that will keep you wanting more.